“Cradle the Moon” by Cassandra Kubinski is the 11th song in The FIRST Alive with Clive Top 20. 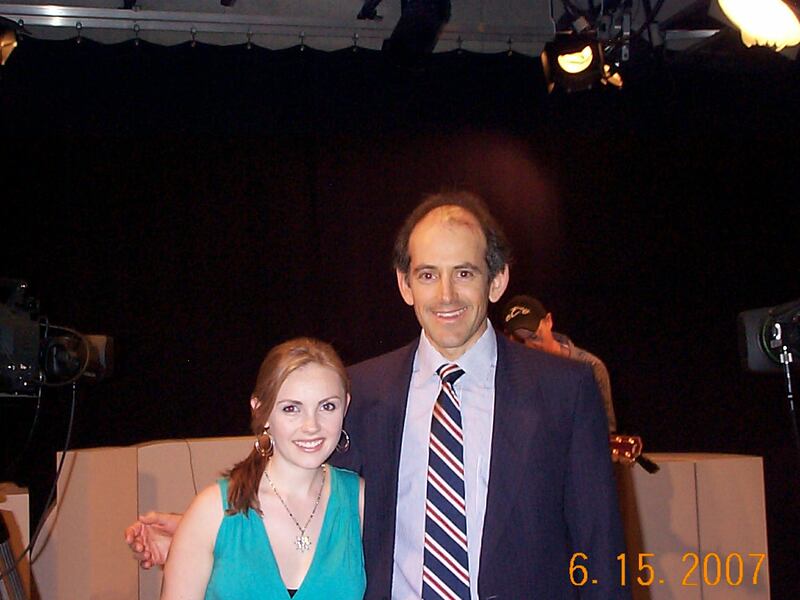 Cassandra has appeared on Alive with Clive on four occasions – on June 15, 2007 accompanied by James Adamo; on May 2, 2008; on June 27, 2008 with Firan “4RON” Chisolm; and on January 8, 2010 – and performed “Cradle the Moon,” from her second CD, Hold The Sun, during her first interview on Alive with Clive on June 15, 2007. Cassandra began songwriting with an eye towards making it her profession while attending Florida State University for theatre (she was a professional actress from age 13, racking up credits from the 20th anniversary production of “Annie” to the film “Finding Forrester” and the TV show “Spin City”). Over the last decade, her musical and theatrical world travels have taken her from roots in Enfield, CT, to NYC, to Nashville, to Germany, and beyond. Cassandra’s brand of dramatic, sensual, personal, classy, and sassy continues to earn her a wide demographic of fans, all of whom are willing to live their lives through the whole range of emotions, from poignant “what might have been” heartbreak to expansive gratefulness to fiery lust. Cassandra is currently celebrating the release of her third album, LIVE at Camp Nashville, her first live album release and most personal album to date. Recorded in Nashville, TN, in one continuous evening, the album features a first act of intensely personal songs, reminiscent of Joni and Jackson, or, more contemporarily, John Mayer and Sarah McLachlan. It includes such original Cassandra fan favorites as “Sometime After Midnight,” “If,” “Everybody Waits,” “Chemical Imbalance” and “Freedom,” as well as a uniquely bittersweet cover of Journey’s “Separate Ways” and a cover of Matt Nathanson’s “Come On, Get Higher.” The second act is comprised of songs from Cassandra’s previous two albums, songs written with her production team, TRIFECTA, and songs she pitches to pop and country artists. Her two studio records, 2007’s Hold the Sun, and 2005’s hiding underneath garnered awards from Billboard, The Songwriters Hall of Fame, and the Positive Pop Song Contest and are available in hardcopy and digital release from CDBaby.com and all digital retailers, including iTunes. As an actress, Cassandra played Sam in and contributed songs to Clear Blue Tuesday, a rock movie musical about how the lives of 11 New Yorkers were affected by 9/11. It premiered in NYC on September 10, 2009. Currently, Cassandra’s work encompasses her own artist career as well as vocal work for demo, jingle, and voice-over clients worldwide both on location and from her own SunChild Studios. She is also writing songs with her production team, TRIFECTA, whose recent successes include placements on the Oxygen Network, TLC, and MTV, as well as signing a single song deal for “I’m Amazing” with Laurus One Publishing/S1 Songs America NYC. TRIFECTA writes songs for pop artists like Rihanna, Miley Cyrus, Pussycat Dolls, Britney Spears, and Faith Hill. Cassandra also contributes songs and/or performances for charitable causes from LifeBEAT (The Music Industry Fights AIDS) to The American Cancer Society to Invisible Children, and teaches on creativity and music issues individually and in the public/private educational sector. I personally believe that Cassandra is one of the most brilliant, talented and amazing songwriters in the world today! Cassandra has previously been featured on my Blog in the post, “The ‘PATH’ To Creativity,” and the post, “Let’s Show Our Support For Cassandra!,” as well as in Press Releases I have written about her, which you can see when you click here and here. “Cradle The Moon” is a song about being in an uplifting relationship, such that when life is beating you up and wearing you down, you come home to the one you love who believes in you and inspires you, and you once again become invigorated, energized and empowered to tackle the challenges you face in life with renewed strength and vigor. Oh, how you comfort me! Do you know what that means to me? You give me the stars! Video clips of Cassandra singing “It’s Gonna Be Love,” “That’s Where You’ll Find Me,” “Sometime After Midnight,” “She’s Worth It” with Firan “4RON” Chisolm, and “Echoes,” are also available for you to see on The Alive with Clive TV Channel on YouTube, which you’ll find when click here. You can learn more about Cassandra and hear a few of her other songs at www.myspace.com/cassandrakubinski and www.myspace.com/songwriterck. Cassandra is currently in 15th place in The Alive with Clive Top 20. To vote for Cassandra to move into the top spot in The Alive with Clive Top 20, click here. This entry was posted in Alive with Clive Top 20 and tagged "Avalanche", "Chemical Imbalance", "Come On, "Echoes", "Everybody Waits", "First Kiss", "Freedom", "I'm Amazing", "It's Gonna Be Love", "Just Being Myself", "Le Freak", "Separate Ways", "That's Where You'll Find Me", "Windblown Girl", 9/11, Africa, Alive with Clive, Alive with Clive Top 20, Alive with Clive TV Channel on YouTube, American Cancer Society, Anna Nalick, Annie, Artist to Watch, Billboard, Billy Joel, Borders, Borders Books and Music, Britney Spears, Carole King, Cassandra Kubinski, CDBaby, Clear Blue Tuesday, Clive Swersky, Connecticut, Cradle The Moon, Dickie Betts, Disney, Edd Kalehoff, Enfield, Faith Hill, Finding Forrester, Firan '4RON' Chisolm, Florida State University, Germany, Get Higher", hiding underneath, HIV, HIV/AIDS, Hold The Sun, Ingram Hill, Invisible Children, iTunes, James Adamo, John Mayer, Joni and Jackson, Journey, Kalehoff Productions, Laurus One Publishing/S1Songs America NYC, LIew, LifeBeat, Live at Camp Nashville, Matt Nathanson, Miley Cyrus, MTV, Nashville, Nelson Brothers, Nile Rogers, NYC, October Project, Oxygen Network, Positive Pop Song Contest, Pussycat Dolls, Rihanna, Sarah McLachlan, She's Worth It, Sometime After Midnight, South Africa, Spin City, Stephen Sondheim, SunChild Studios, The FIRST Alive with Clive Top 20, The Songwriters Hall of Fame, TLC, TRIFECTA. Bookmark the permalink. I can’t keep up with all this remarkable talent! Bravo Cassandra!